The umami, spicy, sweet, and salty flavors of this eclectic Asian sauce coat charred Japanese shishito peppers, cauliflower, and rainbow carrots. 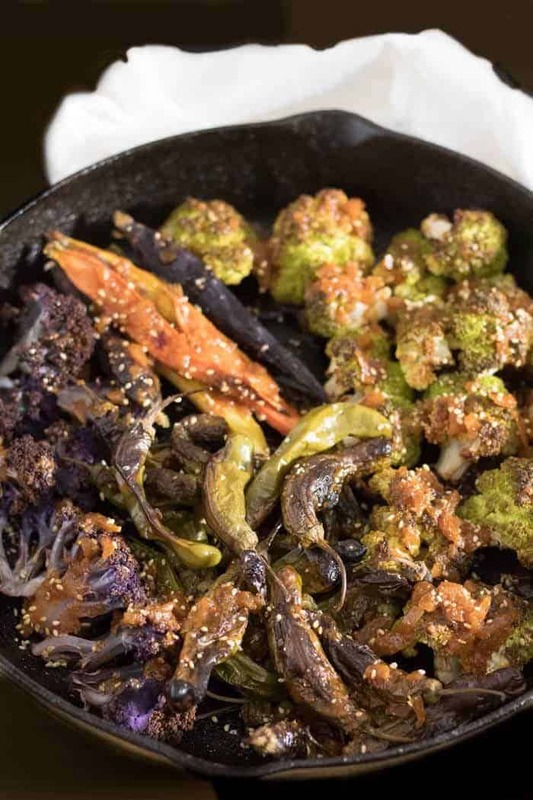 Roasting the vegetables deepens the flavors of Asian Roasted Shishito Peppers With Cauliflower and Rainbow Carrots… Served as a side dish with your favorite Asian protein, this one is sure to please! Have you heard of shishito peppers? Oh my! They are lovely. 🙂 I first had them as an appetizer course at our local eatery Salt, prepared in a simple Asian sauce of nori and gomasio. These chiles do very well in our climate given the fact that they’re a hot weather crop! You’ve probably heard my incessant grumbling about the endless summer in the Rio Grande Valley. 😀 However, that heat brings us some amazing produce year-round! I found the shishitos at our Sprouts market (produce and natural foods), and was so excited! I went with a sesame, tamari, miso, gochujang combination that just bursts with flavor. These little chiles are thin-walled, and not very hot, and coated with this sauce, you’ll be begging for more! Rather than serve as an appetizer course, I opted to do a hearty side dish of roasted vegetables to serve alongside Tamari and Sesame Kissed Crispy Tofu (recipe coming soon). 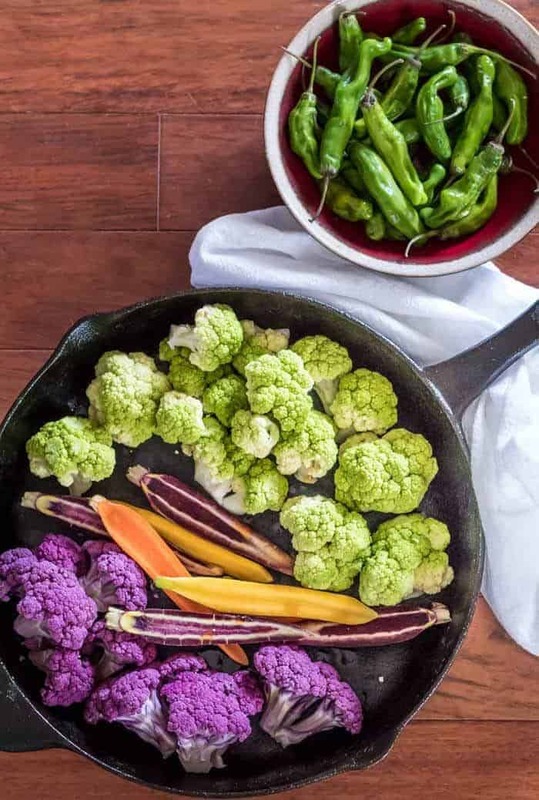 Root vegetables are in season, and the green, purple, and orange cauliflower jumped off the shelf and into my cart! I round out the dish with some beautiful rainbow carrots. You might say I eat with my eyes… colorful food is so appealing. You may be interested to know that a colorful diet provides health benefits you just can’t get from a plate of beige food. Do you pay attention to the visual aspect of your food? The most time consuming aspect of this dish is in roasting the vegetables; they require 35 to 40 minutes. The shishitos join the cauliflower and carrots about 15 minutes into the roasting process. The caramelization (maillard reaction) achieved through roasting coaxes so much flavor out of the vegetables, especially those little chiles! While the vegetables roast, make the simple pan sauce that gets tossed in when they’re done roasting and piping hot. We enjoyed this with the crispy tofu (4 times in 7 days 😆 ), but it would be great with a teriyaki chicken breast as well… Pour a glass of crisp rosé, and enjoy! Roasted shishito peppers, cauliflower, and carrots get a an umami, spicy, savory, and sweet Asian flavor boost in a healthy side dish perfect with crispy tofu or teriyaki chicken breast! Preheat oven to 425 degrees (400 convection). Trim the cauliflower into florets. Slice the rainbow carrots lengthwise. See photo. Arrange in a single layer in a heavy baking pan. Drizzle with sesame oil. Roast 15 minutes. Add shishito peppers, and drizzle with sesame oil. Roast 40- 45 minutes total until cauliflower and carrots are caramelized and fork tender. While veggies roast, make the sauce. To a small saute pan on medium-high heat, add the sesame oil, garlic, ginger, and shallot. Saute until shallot is soft. Add the rice wine and broth or stock. Cook 4-5 minutes until slightly reduced. Whisk in the gochujang, miso paste, tamari or soy sauce, mirin, and rice vinegar. Whisk until well combined. 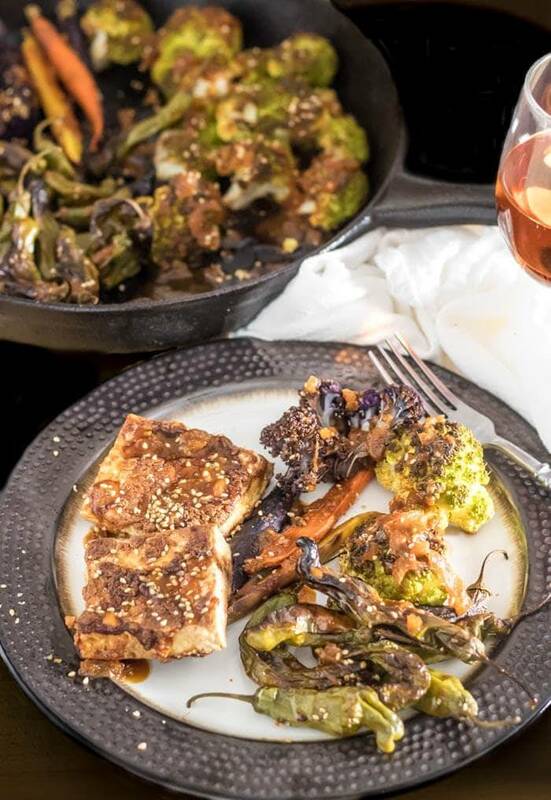 Toss the sauce with the roasted vegetables, and garnish with toasted sesame seeds. As I mentioned, I love color on my plate! I typically have the option of purple, green, orange, and white cauliflower... I choose whatever looks freshest. They tend to be smaller heads, so we usually do 2 heads. It's great leftover for lunch (even cold). You can substitute whatever carrots are fresh and available. You can even substitute small wedges of golden beets or Japanese white turnips. We love this dish with firm tofu that is pressed and brushed with sesame oil, tamari, and cornstarch before being roasted with the veggies or shallow fried on the cooktop!